While reviewing London Blitz I recall mentioning Tunnel Runner several times as a maze game that did it right, so it seems only fitting that I go in depth as to why I think so. 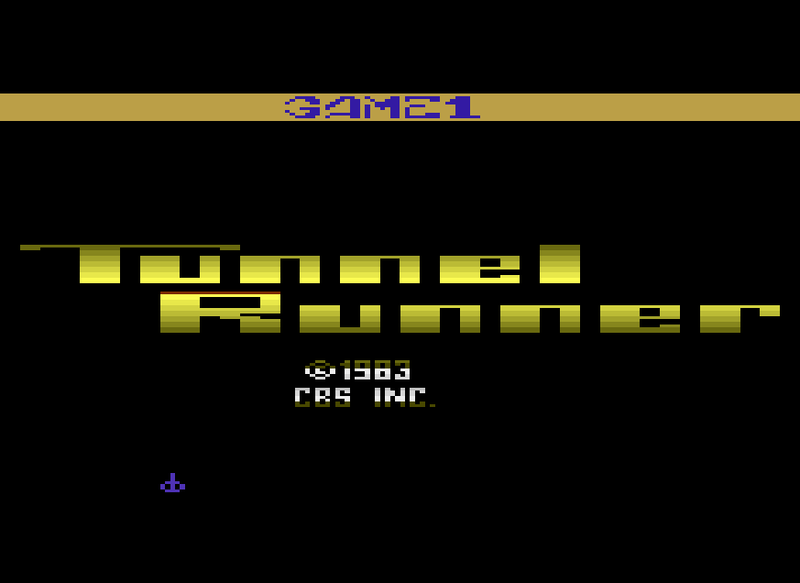 Tunnel Runner is the hardest game to find from CBS Electronics but is well worth it. I found something quite touching actually with this game, I got lucky and snagged a cart with the manual and on the back of said manual there are a couple paragraphs about the programmers themselves (probably written by the programmers themselves), it’s very charming so I’m going to type it out for you. That’s just downright wholesome and I feel better now after reading it. If any of you guys are around just know that you did good. Let’s get going with the graphics. 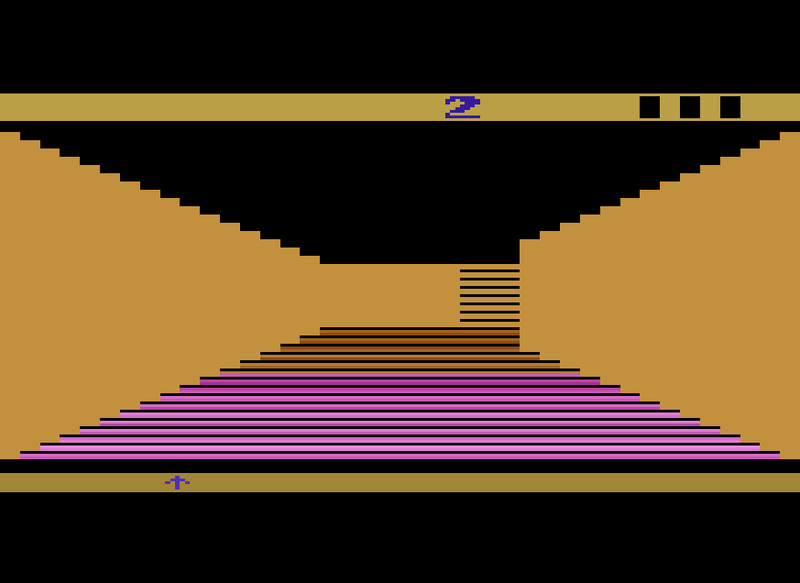 Tunnel Runner starts out strong with an excellent eye catching title screen that wouldn’t look out of place on a much more powerful system. When you start the game you are treated tone of the most satisfying things ever, watching the computer build the maze for you, I don’t know by what process it does this it’s just really cool to look at, as far as I can tell it generates the same mazes every time you start the game, so it’s not randomized that’s what game two is for. 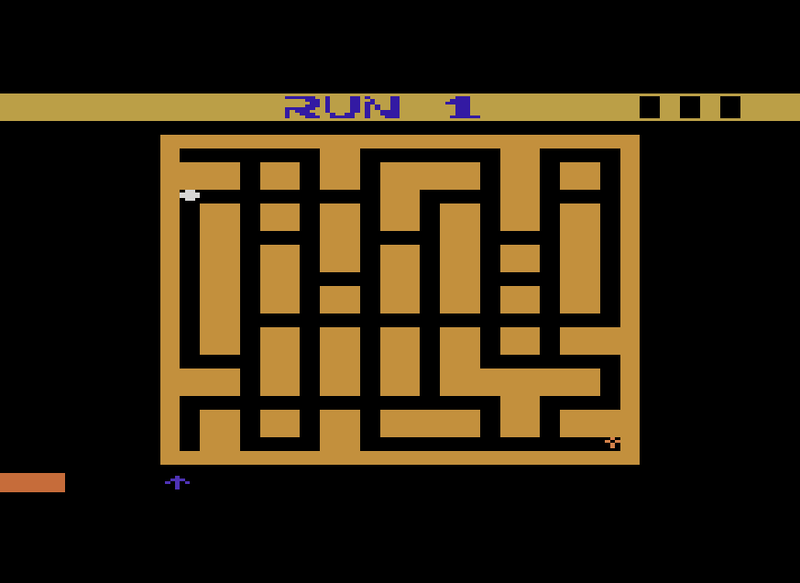 The actual maze screen is okay, it’s quite advanced for the 2600 but it still ends up looking a bit bland, but the game has ways of shaking things up. The floor changes through color gradients as you move through the maze imparting a sense of motion; you also don’t feel as if you’re moving on a grid since everything scales pretty well, it doesn’t feel fluid like in Escape from the Mindmaster but it’s still big a step up from London Blitz or even Crypts of Chaos. Another nice touch that you’ll notice is how the color of the walls changes with the level, the same thing goes with the color of the maze/map screen. You have pretty good visibility so you can see pretty far ahead so you can plan your route as you avoid the dreaded Zots. These things are scary looking; I’ll let the pictures speak for themselves. Alright, so we have a graphically impressive looking game, usually if the standard formula is followed one of the subsequent categories, sounds and gameplay, will suffer greatly due to it, which will it be? Well it ain’t the sounds! This game uses sounds perfectly. I must refer back to Escape from the Mindmaster again, when in close proximity to an enemy a tune will play otherwise it’s just you with your thoughts and footsteps echoing through the endless mazes. When in close proximity to a Zot a tune will begin to play, this tune is actually quite jovial and bouncy unfortunately it’s attached to a Zot, and when you hear it it’s time to panic and run away as fast as you can! Since the sounds haven’t suffered it seems that the gameplay must now suffer. The gameplay does not suffer! This game is great fun! The premise is simple… escape or be eaten, well actually it’s a bit more complicated than that. You are stuck in a great big maze and you must evade the evil Zots to escape to the next maze, and then the next, and the next, repeat ad nauseam. The key to your success is the key to your success, you must collect the odd triangular key and then find the exit door hidden somewhere in the maze. There are three and a half kinds of doors, there are the up and double up doors which will bring you up a maze or two if you have the key for them, the transport doors that will take you to a random point in the maze, and the down door that takes you to the previous maze (you really don’t want to do that. )Since the 2600 was incapable of displaying doors on the walls whilst you are moving the programmers found a clever workaround, just make the floors go al disco and flash through a rainbow gradient. When you stumble upon one of these disco floors simply turn to the side, or the other if you faced the wrong way the first time, and you’ll be faced with a door, just be careful of which one you pick. As you progress through the game you’ll be faced with new challenges the hardest being the invisible mazes where you cannot see the maze layout from the map screen and can only reveal parts of the maze by running through it. The Zots will also increase in difficulty, you’ll start with mainly grey Zots, which are dumb as bricks and about as fast. You’ll start to get a white Zot or two which are faster and smarter culminating in the red Zot which has the equivalent IQ of an evil Einstein, he’ll kill you dead.